This October/November, metal icons ARCH ENEMY will be returning to North American soil to tour in support of their new album, War Eternal! To celebrate this momentous headlining trek, the band will be releasing a split 7" with KREATOR, who are direct support on the run. Available starting at the Baltimore show on October 23, be sure to purchase this exclusive transparent red 7" (limited to 500 copies) at the merch table; a dark red 7" (limited to 500 copies) will also be available on KREATOR and ARCH ENEMY's European tour, which sees ARCH ENEMY as direct support. ARCH ENEMY's Michael Amott (guitar) comments: "Super excited about the upcoming tours in Europe and USA with KREATOR, and it's really cool to have this split vinyl 7" coming out to celebrate the extreme metal party of the year! Covering the JUDAS PRIEST classic "Breaking The Law" is obviously not the most original idea, but this is a heavily rearranged version that sounds very ARCH ENEMY, and anyhow there's no denying that the mighty PRIEST is a great influence on ARCH ENEMY...Enjoy this unique and limited KREATOR/ARCH ENEMY release and see you on the road!" 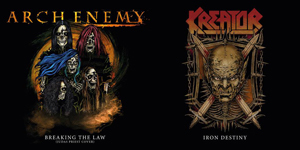 KREATOR's Mille Petrozza (vocals, guitar) comments: "Finally, after all these years, ARCH ENEMY and KREATOR not only tour together, but will also release a split single! I have always been a fan of this stuff since these are special little collector's items. We chose the song "Iron Destiny" for this. Lyrically this is a tribute to the early days of the band, the days when we were young metal-heads, discovering the music that we still love to this day. KREATOR is looking forward to this run and we hope to see all of you!"